I-Mockery Forum > I-Mockery Site Forums > Forum Events > FORUM EVENT: "I-MOCKERY'S 2014 SECRET SANTA EVENT!" Mockery Excellent! Glad everybody enjoyed their goodies and the 2014 Secret Santa event went off without a hitch. Nicely done everyone, and BIG THANKS to Dextire for running the show for the first time this year! dextire Mighty fine video, inferno! I love the geeky chaos of that room. As I'm off to somewhere I'm pretty sure still doesn't even have 3g coverage, Merry Christmas everyone! inferno I exist! With a video showing the presents I got this year from power duo Rog and Dr. Boogie, as I first opened them! After getting most of my assignments done, I have finally edited and uploaded this video. Note that the quietness and any perceived lack of joyousness is entirely due to it being 5am at my time of filming. I really like the gifts I got. Also, here is the letter I sent Dr. Boogie. dextire Great job on the videos, guys! "Chest net chess tips". So all that's left is for inferno to post pictures and we'll have this year's event all wrapped up! I think Protoclown's video may have outshone my own because it featured a cat cameo as well as a sword in the background - which he so totally would own. Thanks again for the great gifts though Thanos, my friends think it was all pretty rad. ps Definitely awesome that Kobra Khan can do that!! I forgot to mention - that purple monster is the Bug Eye Ghost from the Real Ghostbusters toy series. 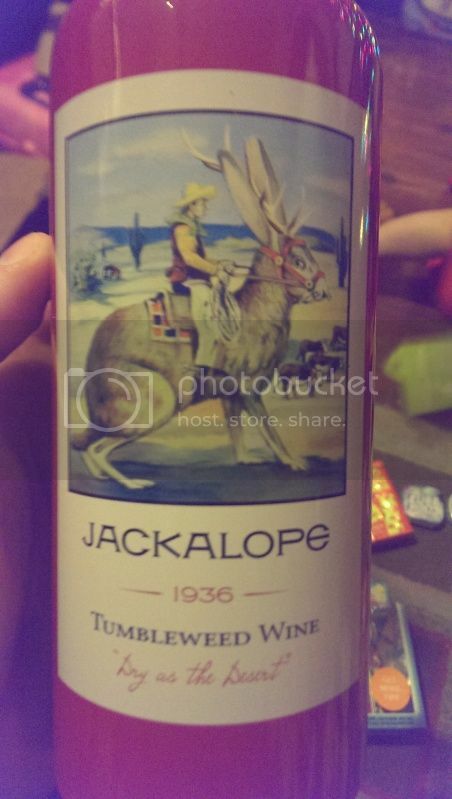 It was released in 1987. You can pop his large eye out of his head. It's attached to a string. Just be careful - the eye and string are both known to break on the figure if not handled with care. Finding a good one without damage (like the one I sent you) can be difficult. MarioRPG I think Protoclown's video may have outshone my own because it featured a cat cameo as well as a sword in the background - which he so totally would own. Thanks again for the great gifts though Thanos, my friends think it was all pretty rad. ps Definitely awesome that Kobra Khan can do that!! Thanos Rock on MarioRPG! Great video. Glad everything was to your liking. That green monster was indeed a Masters of the Universe figure. It's Kobra Khan. You can remove his head and fill his body with water. Replace the head and push down and he'll spit "venom" out his mouth. How cool?! MarioRPG As promised - here is the video of my gift openings. For those of you that don't watch videos, I received a bunch of 80s toys and some comics - you should watch the video! blood_panther looking good! as an update, it looks like just MarioRPG and inferno have yet to get their gifts. 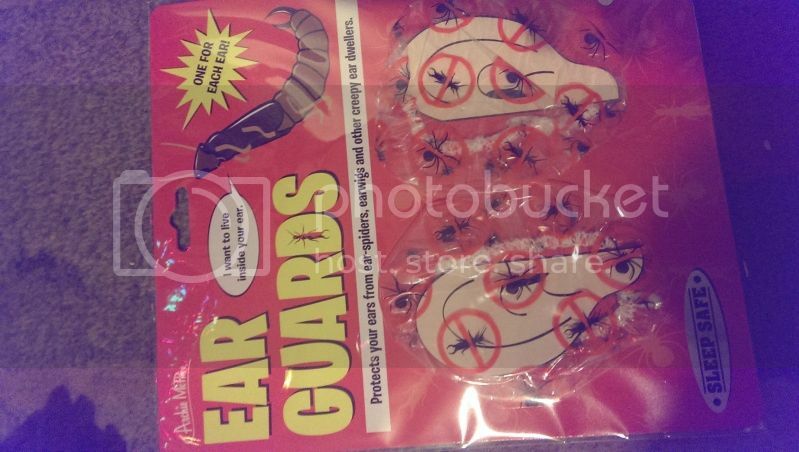 (or at least post them) on the flip side Thanos and (If i'm understanding this whole 2 gifts set out thing) Dr. Boogie are left from the possible secret santas. Everythings gone really smooth this year. Protoclown I received my package from 10,000 Volt Ghost yesterday! Woot! 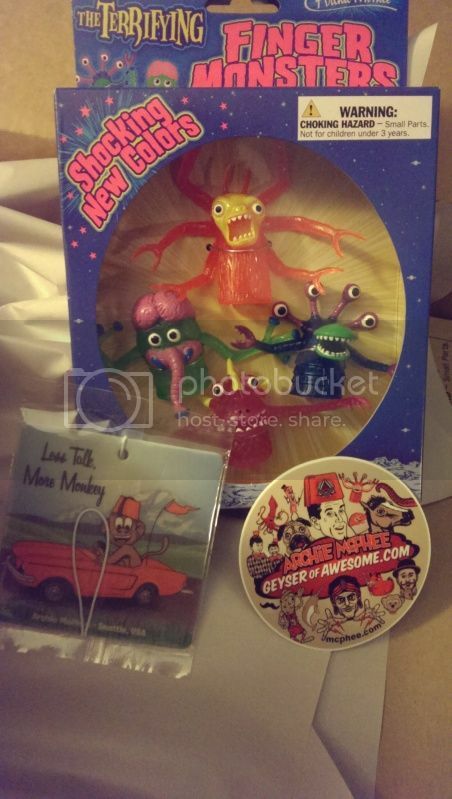 Thank you for the box of wondrous goodies! And with the help of my friend Karim, I have made a video of the opening! My recipient should have received their package today. Mwahahahahahah! I did receive the package on that day, but it took me a while to make a video because I am not good with computer. Once again, I will add the disclaimer that I sound very sarcastic / unappreciative but that is certainly not the case! I will have the video up tomorrow. BatmanJohnson Great pictures Dextire! I wanted to get you a Rat queens trade, but my favorite shop was out. So I sent another favorite Saga. I thought action Philosophers was amusing enough. No note so not sure who sent it. Anyway happy Santa day. Thanos My recipient should have received their package today. Mwahahahahahah! dextire A fine couple of hauls, Dr. Boogie! 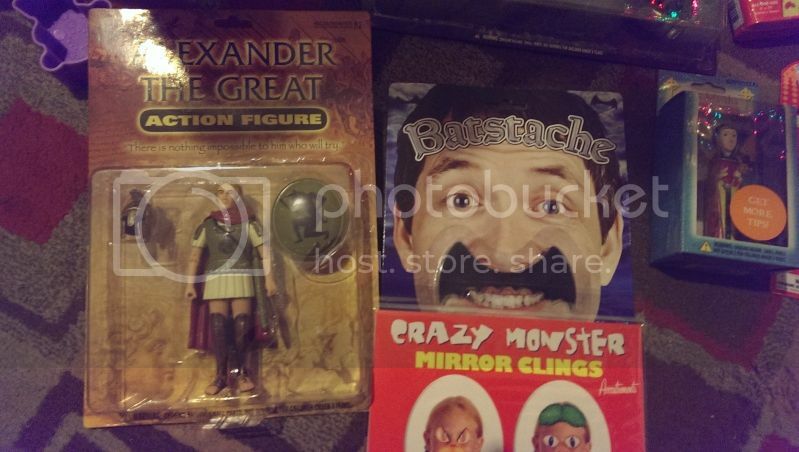 Okay, I got my package from BatmanJohnson and here's the pics! 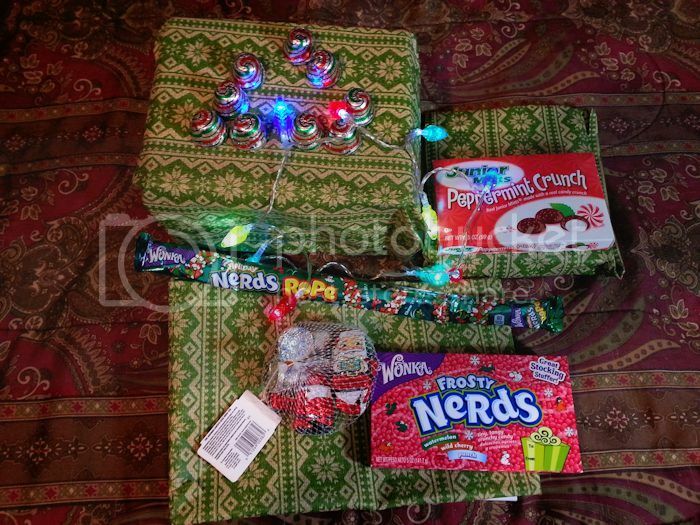 Some nicely wrapped gifts along with a bunch of Christmas candy! The Santa ones are Crisp Kringles, ho ho ho! Now that's quite a haul! 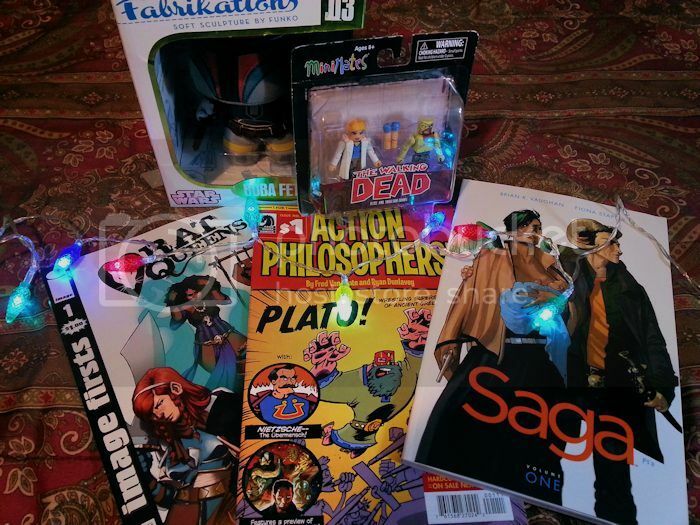 Comics, Zombies, and Boba Fett! Rat Queens has four Daves. Action Philosophers has Plato necromancing Socrates back. And Saga is just all kinds of messed up. 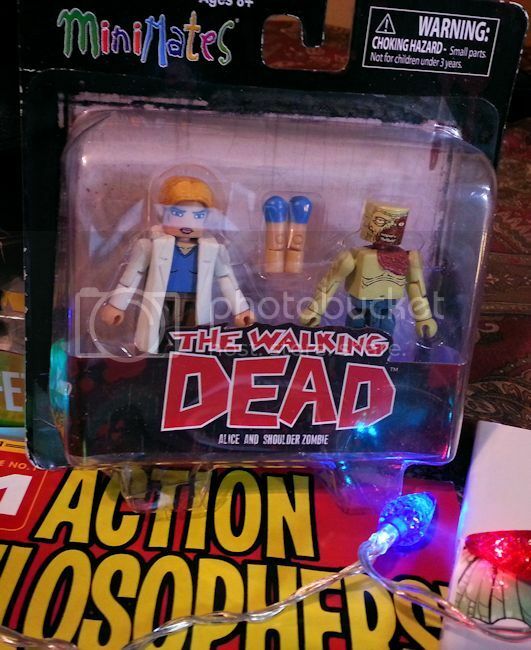 Here we have "The Walking Dead" MiniMates. Tiny little Lego type figures. And the two things in the middle are shoulders for "Shoulder Zombie" to munch on! 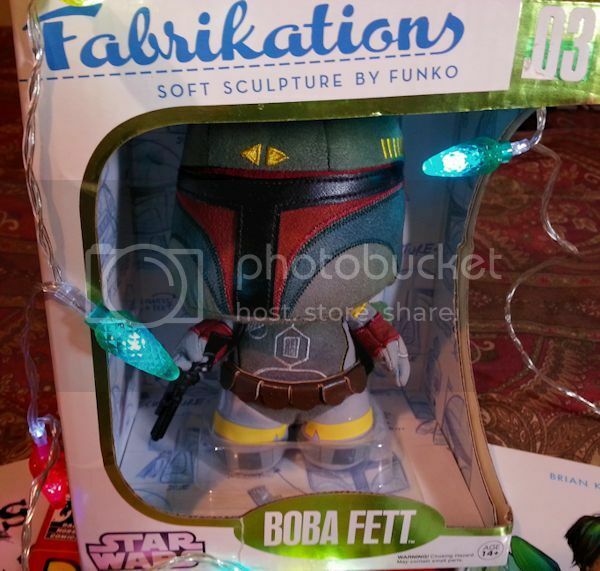 And lastly we have a Boba Fett "fabrikation" from Funko! He's fabric with an awesome leather belt, can turn his head 360°, and has heavy flat feet to stand up easily. Thanks for the great stuff, BatmanJohnson! 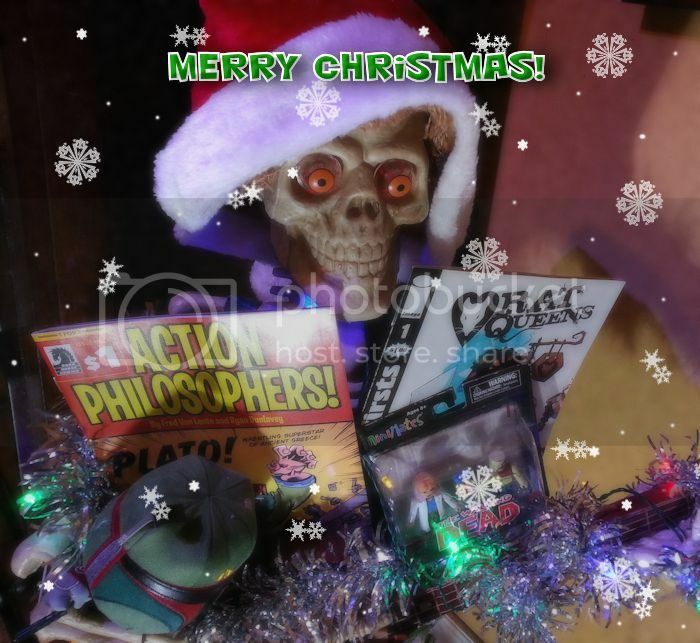 And Merry Christmas, everybody! 10,000 Volt Ghost Got my package in the mail today. 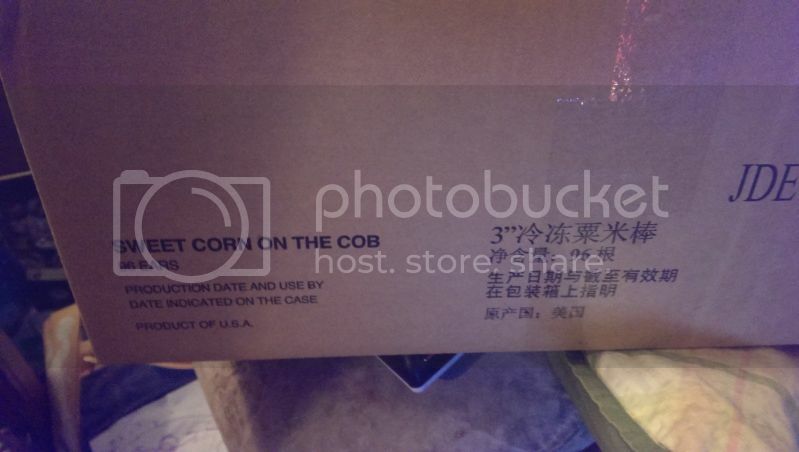 Pics are up in photo bucket butI need to get into my pc to properly put them in a post. Dr. Boogie Ah. Apologies for the mix-up. And that does make more sense about the zombie cat being an ornament, and not an especially small necklace/large bracelet. Mockery Excellent hauls so far, everyone! Also, Dr. Boogie giving Thanos candy along with a note joking about diabetes is like some kind of twisted Christmas miracle. Glad you can still make good use of the candies, Thanos! If we do another Secret Santa event next year, make sure you add "candy" alongside "pillows" to your list of things you don't want people to purchase for ya. Anyway, keep the gift posts coming. According to Dextire, we're halfway done! replicant LOL! Just to be clear - I don't have man parts. I am a lady. I am glad you didn't choke yourself to death because that's a Zombie Kitty Tree Ornament. LOL! It's made from Perler Beads. 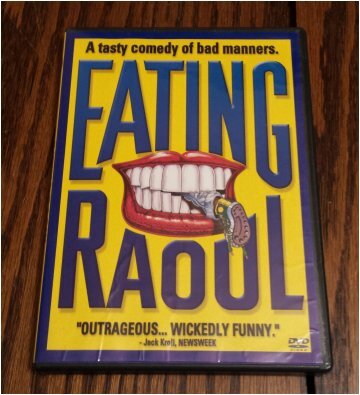 Eating Raoul is dark comedy from the 80s. It's pretty nutty. Sonique is trance. Count Basic is Acid Jazz but it's Kruder remixing so it's a bit of an added electronica element. 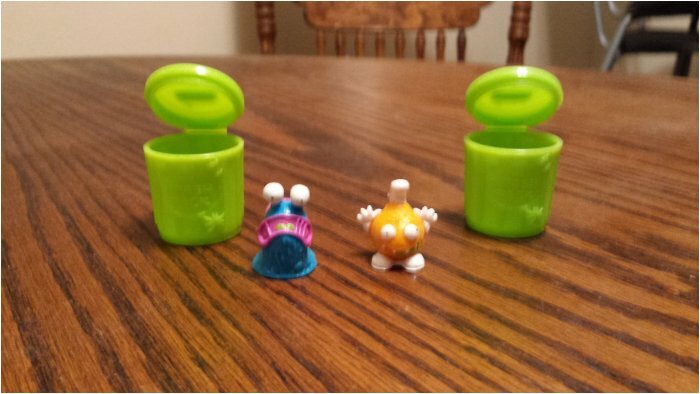 First were a couple of Trash Pack figures. I call them Sammy Slug and Reinhard Drumstick. 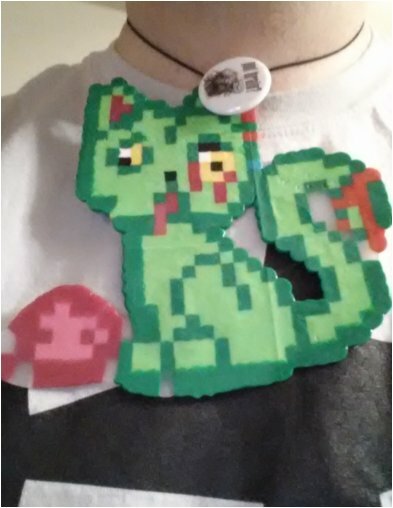 I am totally blanking out on what you call that old toy where you put the beads down in a pattern and then melt them together, but here's a necklace of a zombie kitty with brains, and a zombie pin to match. I did almost choke myself out putting the thing around my neck. 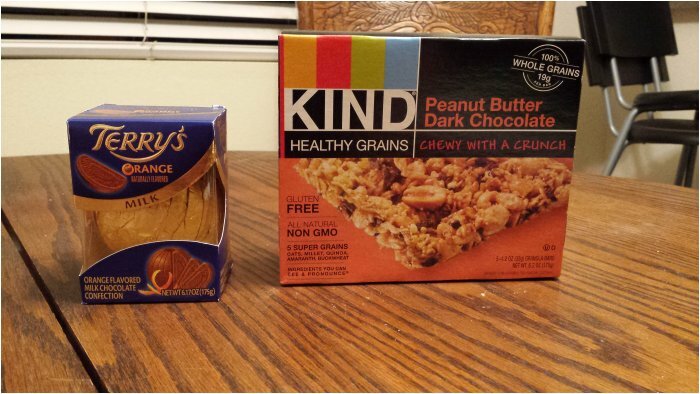 On the edible front, I got one of those milk chocolate orange things and some peanut butter chocolate breakfast bar. Chocolate really is one of the best things to get for Xmas (again, apologies to Thanos). 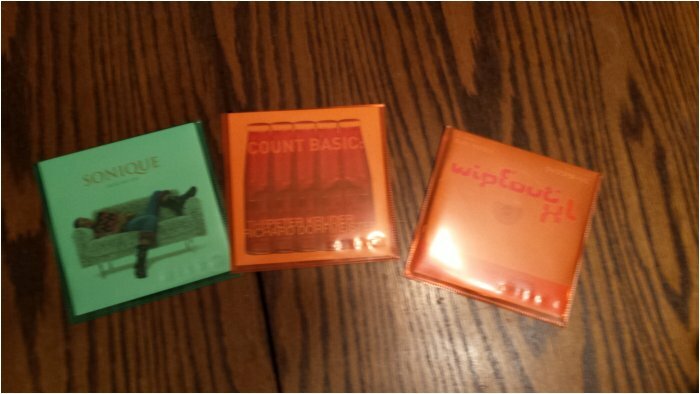 And here, a selection of CDs. The Wipeout XL soundtrack I recognized because video games, but Count Basic and Sonique I am not familiar with. Still, always good to branch out so that you're not just stuck listening to Huey Lewis and the Backstreet Boys. If there's a funnier movie about cannibalism, I haven't seen it (maybe Cannibal: The Musical, but it's close). Title kinda gives the ending away, though. 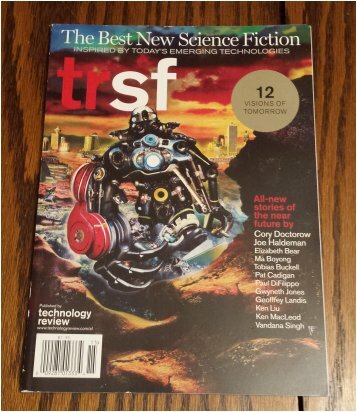 An anthology of science fiction stories. And not just any sci-fi stories; these are based on stuff MIT claims could actually be developed, rather than the sort of ill-explained, magical technology in a lot of sci fi stories. Take that, Arthur C. Clarke! 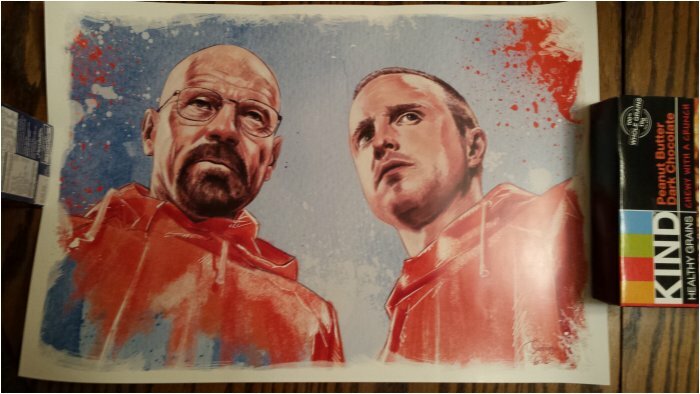 This was a pretty impressive poster of Jesse and Walt from Breaking Bad. I don't have any glib comments to make about it. It's just a pretty cool poster. 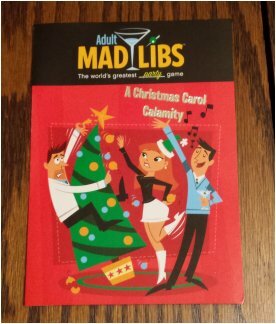 Last of all was a Mad Libs card. 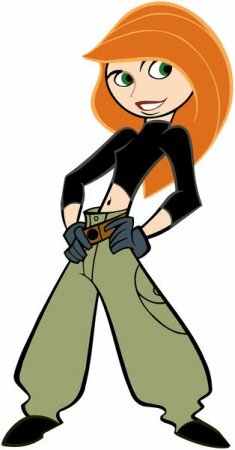 I had the package sent to my office, and the first thing the front desk guy and I thought upon see it was "is that Kim Possible?" Dying through the Cape Canaveral in a one-horse open jetpack. O'er the fields we go, fencing all the way. Bells on John's tail ring, making spirits bright. What fun it is to ride and sing a digging song tonight. Jingle boots, jingle bells, jingle all the way! Oh, what fun it is to shock in a one-aardvark open sled. 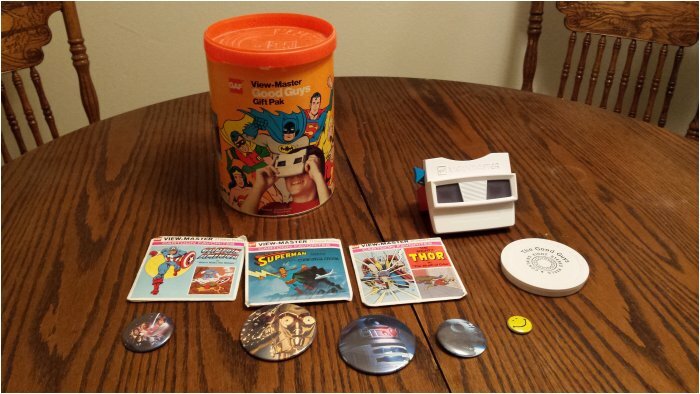 It's a Viewmaster package featuring several famous comic book heroes, from both DC and MArvel strangely enough. And rounding it out, a few Star Wars buttons. I really enjoyed how perfectly the Death Star fit onto the button. 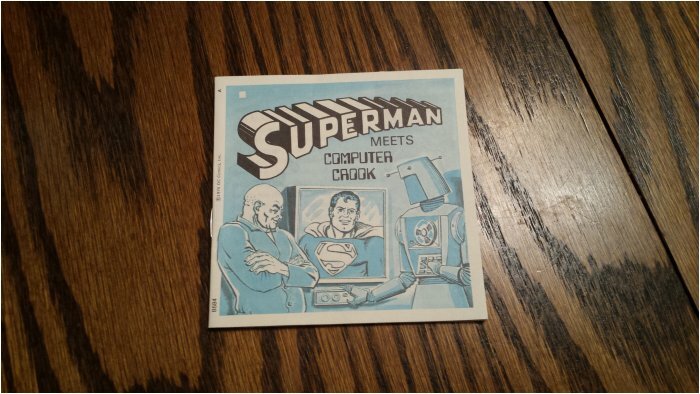 The superhero ones came on a series of discs, and some came with books to provide extra exposition with each slide. I admit I don't know much about Viewmasters, but I thought the idea was to just look through them and see some cool pictures. Having to look through and break to do some reading seems kinda antithetical to the whole experience. And as if that weren't confusing enough, the books had their own pictures, too! 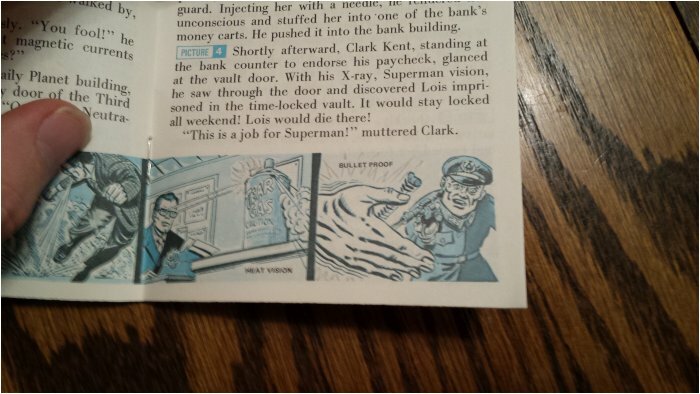 In this one, Superman is getting shot in the hand by Benito Mussolini. Weird book.